The Outdoorsman. My husband. The Trooper’s father. Step-father to Brave Heart and Miss Sunshine. An amazing husband, father, step-father, son, brother, son-in-law, nephew, and friend. His life has been divided into different stages that seem like the lives of three or four completely different people. It seems impossible that one mere man could have done all of this before he reached the age of fifty. Stage one occurred due south of Houston, Texas about 20 miles from Galveston and included an adventurous, outdoorsy family who all hunted, fished, camped, swam, boated, rode dirt bikes, and were involved in a small Southern Baptist church. During his formative years, The Outdoorsman worked hard beside his parents learning how to take care of a their expansive yard, learning how to fix up and repair all kinds of cars, boats, and motorcycles, learning to paint and work on houses, and learning to serve faithfully at the local church. His early life also included summer-long stays at his maternal grandfather’s ranch where The Outdoorsman spent his days riding horses, herding cattle, cutting and baling hay, attending cattle auctions, and spending time at the local cafe with Papa. While in East Texas, he also stayed with his paternal grandparents and learned how to tend to a garden, raise food for the family, and preserve food from the garden. He spent hours snapping peas from the garden with Mamaw, going fishing with her and Papaw, and enjoying life in rural East Texas. It was this stage of life that actually made our current life on Green Acres not only easier, but entirely possible. The things he learned by watching and listening to his parents’ and grandparents’ expertise on various subjects stuck with him and transferred into our new life on the farm almost thirty years later! I am thankful for God’s faithful provision and training in these areas. Stage two of The Outdoorsman’s life occurred after he left home and ventured into the world of professional football as an equipment manager. He started out at Sam Houston State University, headed to Southern Methodist University, and then, went from a volunteer position with the NFL Houston Oilers to a paid position as the assistant equipment manager with the Houston Oilers. His position with the Oilers led to a move to Nashville, Tennessee with the franchise to be one of the three equipment managers with the Tennessee Titans. Through his position with the Oilers and Titans, he formed close friendships with the Head Coach, Jeff Fisher, and NFL players such as Eddie George, Al Del Greco, Steve McNair, Jon Runyon, and more. The Outdoorsman rarely ever tells stories about those days, but I have gleaned some pretty interesting tidbits over our fifteen years of marriage that are merely a glimpse into the crazy, almost unbelievable life that he lived during that era. Trips to the Indianapolis 500 with Troy Aikman and other NFL players; driving the players Lamborghinis and other fancy cars to training camp; hanging out with Vince Gill and being a guest at Vince Gill and Amy Grant’s wedding; becoming friends with the members of The Black Crows and then visiting Goldie Hawn’s house where she scrambled him some eggs with cream cheese for breakfast when her famous daughter, Kate Hudson, married one of the band member of the Black Crows; meeting Ashley Judd when she found him cramped up and lying in her driveway while he was training for the Nashville marathon and then hanging out with her at her house and going to hockey games afterwards; running around Nashville with Kenny Chesney; doing uniform fittings with Shania Twain and Sara Evans for their gear during the halftime performances at the Titans games; being the snapper for Al Del Greco during pre-game warm ups; throwing the ball with Steve McNair before games and finding places for Steve to take his famous two-hour nap at every stadium before the game; experiencing the thrill of a trip to Super Bowl XXXIV as a part of the Tennessee Titans; fishing with and playing practical jokes on Jeff Fisher; having practical jokes played on him by Jeff Fisher. The thing that frequently happens is that we will be watching a movie, a football game, a commercial, or listening to a song on the radio and he will say “I use to hang out with him when I lived in Nashville.” I will be like “What? You fished with Vince Gill? You went to hockey games with Kenny Chesney?” Then he will tell me the stories. The stories are never brought up out of the blue by him, but only prompted when that person appears on TV in some venue such as a football commentator like Eddie George or Spencer Tillman. He will then tell me about a trip he took with them, a restaurant he ate at with them, or an experience he had with them. He always says it casually like it’s no big deal. Everyone does it. Just hanging out with famous NFL greats like Eddie George, Steve McNair and Jeff Fisher. Just going on road trips with them. Attending weddings with famous people. Getting in fights with them. Yep. He hasn’t liked Tom Brady since they got into a screaming match on the practice field when Tom was rude about a practice punt of Al Del Greco’s that accidentally rolled into his practice area. My part of the story ended with The Outdoorsman hitting ole Tom himself in the head with a football and then Tom flipping him off….which NEVER goes over well with The Outdoorsman. After that, he said, “I’m not gonna tell you what happened next…….” and he kept his promise and didn’t tell me what happened after that, but I can imagine that other players had to get involved. To this day, The Outdoorsman will cheer on ANY team that goes against Tom Brady. While with the NFL, he also had the opportunity to serve as the equipment manager for the Amsterdam Admirals as a part of NFL Europe. While working in Amsterdam, he traveled all over Europe playing other NFL Europe teams and doing all of the travel arrangements, packing, and uniforms for his team. I had no idea the amount of work that went into each game until after we were married. When he wasn’t busy managing equipment, he took the opportunities with NFL Europe to see sites all across Europe. Again, we will be watching television or I will be talking about visiting a country and he will casually say “I’ve been there. They have a great pub in the downtown area.” or something along those lines. He will not bring it up before that moment when I actually name the city, state, or foreign country. It cracks me up how he doesn’t think to mention it until then. When we got married, he worked for the AFL team, the Austin Wranglers. The manager was NFL standout, Glyn Milburn, who is an outstanding man and athlete. We enjoyed our years with the Austin Wranglers interacting with Glyn, other investors in the team such as Deion Sanders, players such as former NFL quarterback Scott Dreisbach, and many other outstanding young men and coaches. The years with the Wranglers were fun, but The Outdoorsman realized that it was too difficult for our family to live and work in two different cities so he gave up his football career and took a completely different job as a Safety Specialist at MD Anderson Cancer Center in Downtown Houston, Texas. (The reason we were in two different cities is because, when we met, I was living with my children and teaching middle school in the wonderful school district in Deer Park, Texas.) Talking about a different life for The Outdoorsman!! He was accustomed to being outside for most of his days working on football fields and uniforms and conducting practices. His job was very intense and demanding for about eight months out of each year and then the off-season was full of rest and recuperation. In his new world of work at MD Anderson Hospital, life was pretty predictable and scheduled. He enjoyed his colleagues at the hospital immensely and I am so thankful for each one of them because, I am positive, that they kept him going on days when he must have wondered what he had gotten himself into after such an exciting life on the road with the NFL and AFL. The reason I am certain that he was an excellent equipment manager is because, after he resigned from his equipment job and started working at MD Anderson, he still had well-respected coaches calling and emailing him about working for their teams. One afternoon, we were standing in our backyard in League City and his phone rang. He picked it up and said “Yes, this is “the” D. Green. Is this “the” Jerry Glanville?” There was a pause as Jerry answered him, then Darren said “Are you wearing black?” Haha!! Jerry Glanville had just called my husband and asked him to be the General Manager of his new team up in Hartford, Connecticut. He had been referred to him by some coaches and players in the NFL. I couldn’t believe it! I’m not even sure he would have mentioned it to me if I hadn’t heard the conversation. On another day, the University of Tennessee Athletic Director contacted him to be their equipment manager. The thing that all these coaches and entities didn’t realize is that The Outdoorsman would NEVER move our family that far away from his daughter, The Trooper, who lived in Central Texas. We briefly discussed the position with Tennessee and wondered if we could work in a flight for The Trooper at least once a month until she started college and would, most likely, receive an almost free college education. It was just too much to imagine not being able to attend The Trooper’s sporting events or activities while she was in school in Texas so we passed on the opportunity. 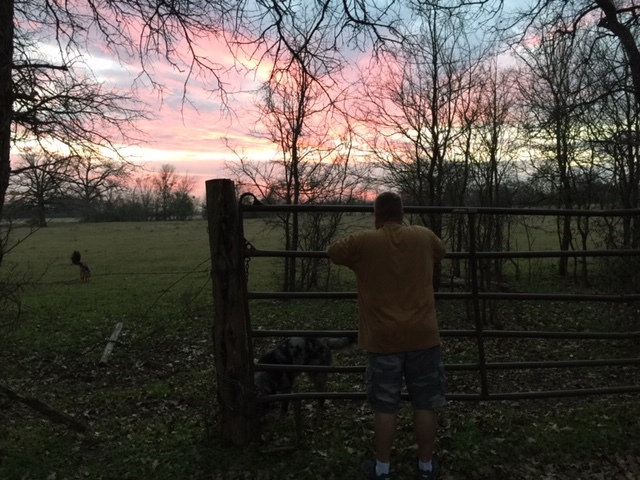 I knew it was hard for The Outdoorsman to give up what he loved to do for the security of our little family, but he willingly gave it up and has never complained even one little bit because his heart is golden. Now, fast forward to the current stage of life for The Outdoorsman. We decided to make a move to Central Texas to live out our dream of owning a farm and to live closer to The Trooper during her years in high school. His full-time job in Central Texas is Regional Manager of Environment of Care with Baylor, Scott, & White hospital systems. He enjoys his new position and his colleagues in Central Texas. I am thankful for the warm welcome he has received at Baylor, Scott, & White. After work hours each day, he comes home to his job as The Outdoorsman of Green Acres. We are living the dream we have both had in our hearts for years. He is multi-talented and seemingly omniscient about living on a farm. He shreds our pastures. He moves hay bales and hay rings from pasture to pasture. He builds chickens coops. He creates pig sties and animal pens. He hangs barbed wire fences. He runs electric fences. He builds huge pens with cedar posts. He hangs gates to each pasture. He gives medicine to our animals. Besides his work on our farm, he easily assesses and fixes problems with our home, our cars, and our equipment. He isn’t afraid to jump in to any task set in front of him and doesn’t shy away from work in any form. Out of all that he has done in his life, easily the most impressive thing about The Outdoorsman is the way he loves our family. He loves us well, listens to us well, and serves us well. He will do Whatever. It. Takes. (WIT) for our family. Over the years, The Outdoorsman and I have adopted WIT as our family motto. We have both agreed to do Whatever It Takes to make our family happy and healthy. We also try our best to do it with wit. A play on words, but WIT and wit work wonders in any situation. We have raised three strong, loving, intelligent children in a difficult world that included unwanted divorces on both sides, the illness and death of our older children’s father, family pulling at us from six different directions due to our blended family, and a world that doesn’t value boundaries set by families. It has been challenging, exhausting, and exhilarating all at once. With the team we have become over the last fifteen years, we have encouraged and carried one another on a pretty incredible journey as a family of five. Our children were only nine, eight, and two when we were married. Our son has now graduated from the University of Texas, gotten married, and is working in Dallas, Texas. Our oldest daughter is graduating from Baylor University in May and has already earned her teaching certificate for a job as an English teacher next fall. Our youngest daughter is heading into her senior year of high school as a confident, well-adjusted teenager and will be going away to college in only another year!! We are grateful for the way God prepared The Outdoorsman to be hard-working, flexible, and steadfast in leading our family. God has truly gifted The Outdoorsman with the skills of many men. He makes me proud and humble at once. Proud of who he has become and humble at his simple, healthy view of life. He inspires me to be a better person and more trusting of both God and man alike. He sees the best in every situation and rarely holds grudges. (Except with Tom!) He is quick to anger, quick to forgive, quick to move forward, quick to accept responsibility, and quick to point me back to God. I know he will laugh (and his siblings may roll their eyes), but I truly think he can be likened to The Renaissance Man, but in Texas-style instead of European-style. A very well deserved accolade for the birthday boy! Well done.